What a way to kick off MayFest 2019! "With energy pouring out of those instruments.."
​​The Drystones are an award winning young (just 21) lively folk duo from Priddy in Somerset playing violin, guitar and whistle, who have made a big splash since they formed in July 2011. They play a mix of their own music and arrangements of folk tunes given drive, beat and energy. 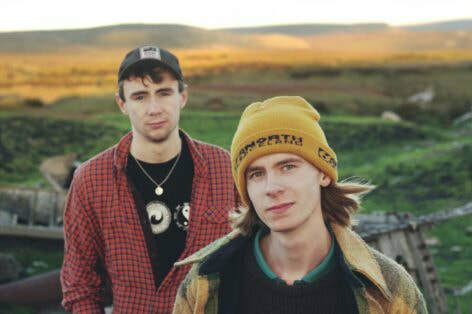 They have played festivals all over the Country (including Sidmouth, Broadstairs, Warwick, Bromyard, Purbeck and Folk East), and at their 2013 Glastonbury Festival performance they were highlighted by Steve Lamacq on Radio 2 as his “recommendation of the day”. They were the 2015 Larmer Tree Breakthrough Music Award winners and were asked by Michael Eavis to play the 2015 Glastonbury Extravaganza when Joan Armatrading had to cancel! Their third CD is a Songlines “Top Of The World” album. For just two people they make a lot of sound, you will not be bored!